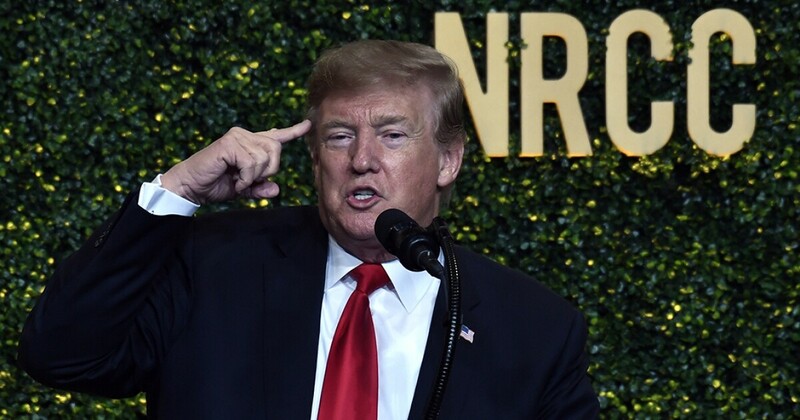 President Trump said on Tuesday that he does not want Republicans to kill the Green New Deal yet because he will be able to run against it in his 2020 re-election campaign. "We have to do something [about the Green New Deal]. But don't do it prematurely, don't kill it because we'll be able to run it." Trump told the Republicans at the National Republican Congress Committee's dinner Tuesday night. "If they hit me with Green New Deal, I deserve to lose." Trump said he would say that the Green New Deal is "a wonderful thing" so he has the opportunity to run against it in the 2020 elections. Trump said several veteran Democrats are behind the Green New Deal and its co-sponsor refreshing Rep. Alexandria Ocasio-Cortez, DN.Y., because "they are petrified of her." He also poked fun that Ocasio-Cortez is 29 years old and used to work as a bartender in New York City before driving to the office. Later Tuesday, senators could block a decision to move forward with the plan by holding a vote on the proposal, a refugee leader Mitch McConnell, R-Ky., As he did to force Democrats to show where they stand on the Green New Deal. Not a Senator voted for the Green New Deal, but most Democrats voted instead of "present" despite several of the same legislators who claimed they would vote for the plan. The Green New Deal is a massive climate and economic overhaul that will ultimately stop the use of fossil fuels and try to address climate change.